Smith, T. P.*, A. M. Hammond, R. N. Story and E. Burris. Abstract: Soil insects are a limiting factor in sweetpotato production in the United States. Studies were conducted in 2006 and 2007 at the LSU AgCenter Sweet Potato Research Station in Chase, LA, which evaluated the effect of labeled preplant insecticide treatments on subsequent insect damage and yield of Beauregard, Evangeline, and Covington sweetpotato varieties. Sweetpotato producers commonly apply one or more preplant insecticides prior to transplanting. These experiments examined the efficacy of select labeled insecticides applied as close to transplanting as possible without the addition of postplant insecticide applications. The majority of insect damage during 2006 and 2007 was attributed to cucumber beetles (rootworms), Diabrotica balteata Leconte and Diabrotica undecimpunctata howardi Barber, and minimal damage was observed for other insect species. Total insect damage and cucumber beetle damage was significantly reduced in the three insecticide treatments evaluated in both years. U.S. No. 1 and total yield grade was significantly higher for the Beauregard variety compared to the Covington and Evangeline varieties, respectively. Yield data were variable between insecticide treatments; the non-treated control plots consistently produced a higher yield than did insecticide treated plots evaluated in this study. A complex of soil insect pests is associated with sweetpotato and can become a major constraint in sweetpotato production in the United States (Schalk et al. 1991). With the exception of weather-related problems and labor issues, soil insects are often recognized as the most important factor limiting the production of the crop in the southeastern United States. The majority of insect damage in sweetpotato occurs on the root surface, which results in unattractive blemishes, often rendering the crop unsuitable for market (Smith et al. 2008). In addition, soil insects can damage sweetpotato roots throughout the growing season. In Louisiana, problematic species include both the banded cucumber beetle, Diabrotica balteata Leconte and the spotted cucumber beetle, Diabrotica undecimpunctata howardi Barber, wireworms, Conoderus spp., flea beetles, Systena spp., the sweetpotato flea beetle, Chaetocnema confinis Crotch, several species of white grubs in the genus Phyllophaga, whitefringed beetles, Naupactus spp., and the sugarcane beetle, Euetheola humilis rugiceps (LeConte) (Smith et al. 2008). Each of the species listed above were characterized as damaging to sweetpotato in a recent published survey of insects affecting sweetpotato in Mississippi (Reed et al. 2009). In addition, research conducted from 2002 to 2007 in conjunction with a multistate USDA-RAMP project, identified the banded cucumber beetle as the most problematic insect species affecting sweetpotato in Louisiana (Hammond et al. 2009). Sweetpotato roots can be injured from the onset of root formation, usually in June or July depending on planting date, until harvest in the fall (Cuthbert 1967) and producers routinely apply prophylactic preplant insecticides to manage the larval stages of several soil insect pests. Until recently, producers had only two chemical control options available for soil insects: ethoprop (Mocap®) and chlorpyrifos (Lorsban®). Chlorpyrifos is the more common of the two chemicals, but historically both of these chemicals were applied prior to planting. More recently, bifenthrin (Capture®, currently labeled as Brigade®) was labeled under a Section 18 emergency exemption from 2001 to 2006 and in 2007 this compound received a full section 3 label for use on sweetpotato in Louisiana. Currently, several 2 EC formulations of bifenthrin are labeled for use on sweetpotato in Louisiana. The efficacy of preplant soil incorporated applications of both Mocap® and Lorsban® has been evaluated extensively for several years in Louisiana (Hammond et al. 2001, Story et al. 2001, Hammond et al. 2007, Hammond et al. 2008). Bifenthrin has also been shown to reduce soil insect damage in sweetpotato in Louisiana (Story et al. 2008). These studies have consistently shown a reduction in damage when applied close to transplanting and in accordance with label directions. Recent on-farm research conducted in conjunction with a USDA-RAMP Southern Sweetpotato IPM Project indicated that tremendous variability exists in application methods and timing of preplant insecticides (Hammond, personal communication). On-farm research results suggested that producers were encountering reduced efficacy and poor control with preplant insecticide applications, presumably due to timing or application issues. In some cases, preplant insecticides were being applied six to eight weeks in advance of planting. In contrast, efficacy studies for these products conducted on LSU AgCenter Research Stations are standardized, in that all insecticide applications are applied as close to transplant as possible, utilizing a recommended application method. The Beauregard variety (Rolston et al. 1987) has been the standard sweetpotato cultivar planted in the United States since its release in 1987 and prior to 2007 this variety dominated United States sweetpotato acreage. In 2006, the Covington variety (Yencho et al. 2008) was released from the North Carolina sweetpotato breeding program and is now planted on over 80% of the sweetpotato acreage in that state (Schultheis, personal communication). In 2007, the Evangeline variety (Labonte et al. 2008) was released from the Louisiana State University Agricultural Center Breeding Program. Approximately 10% of Louisiana’s acreage was planted to this variety in 2008, and this number is expected to increase in future years. The objective of this study was to evaluate the effect of labeled preplant insecticides (bifenthrin, ethoprop, and chlorpyrifos) on insect damage and yield potential of three commercial sweetpotato cultivars in Louisiana. Studies were conducted during 2006 and 2007 at the LSU AgCenter Sweetpotato Research Station, Chase, LA. The same study site was used in both years. The soil type in the field was a Gigger silt loam and the plots were irrigated as needed by using overhead irrigation. No soil or foliar insecticides were applied after the preplant applications in either year. All insecticide treatments were applied the day preceding transplanting in each year. Experimental design was a split plot with insecticides as the main plot and varieties as a sub-plot within each insecticide treatment. Main plot size was 22.86 m (75 ft.)*4 rows. Each main plot was replicated four times. Three sweetpotato varieties, Beauregard, Evangeline, and Covington were randomly assigned to a 7.62 m (25 ft.) section within each main plot. Sweetpotato transplants (all varieties) were planted at a density of 1 plant/0.30 meters (1 ft.) in plots of four rows (centered on 1.07 × 7.62 meters) on 10 July 2006 and 12 July 2007. Insecticides were broadcast, and the beds were double disked and re-hipped immediately following applications. Treatments were applied by using a Ford 3910 tractor with a four-row boom (30 psi). Nozzle (Flat fan 110-04) spacing was set at 50.80 cm (20 in.). The system was calibrated to deliver 187 L/ha (20 GPA). Insecticide treatments included: bifenthrin 0.57 L (19.2 oz.) (Capture®), chlorpyrifos 1.89 L (64 oz.) (Lorsban®), and ethoprop 3.79 L (128 oz.) (Mocap®) and chlorpyrifos 1.89 L (64 oz.) + ethoprop 3.79 L (128 oz.). Data collection and analyses. Adult stages of all soil insects were monitored during each year of the study. Banded cucumber beetles were the primary insect species detected in sweep net samples, however spotted cucumber beetles and whitefringed beetles were also detected. Adult flea beetle and wireworm species were rarely detected during the course of this study. Yield and insect damage were recorded at harvest. The two center rows of each plot were harvested by using a two-row mechanical sweetpotato chain harvester. Sweetpotato roots were field graded into U.S. No. 1, canner, and jumbo grades and were subsequently weighed. U.S. No. 1 and total yields (all yield grades combined) are reported herein. In addition, twenty-five roots were randomly chosen from each plot and evaluated for insect damage after washing. Only one person evaluated insect damage on the storage roots. Cucumber beetle (rootworms), whitefringed beetle, white grub, flea beetle, and total damage classifications to the root were recorded. Damage is reported as the mean percentage of roots damaged by cucumber beetles and total insect damage (all species pooled). Cucumber beetles accounted for the majority of the damage incurred. Damage from all other insect species was minimal and was thus pooled with cucumber beetle data as a representation of total insect damage incurred from all species. All data were analyzed with ANOVA and means separated according to Tukey’s HSD test (SAS 2007). Insect damage between years was significantly different and is presented separately for each year of the study (Table 1 and Table 2). Total insect damage was high in 2006, ranging from 73% injured roots in non-treated plots to 17% injury in plots treated with bifenthrin. Cucumber beetle (CB) damage accounted for the majority of soil insect damage incurred in 2006. All insecticide treatments evaluated had significantly less CB damage and total insect damage (all species) compared to non-treated plots in 2006 (CB: F = 12.05, P < 0.0001; Total: F = 12.82, P < 0.0001) (Table 1). However, the insecticide treatments evaluated did not significantly differ from each other. No significant differences in CB damage were detected between varieties for any insecticides evaluated in 2006 (F = 4.75, P = 0.3357) (Table 3), however the effect of variety was significantly different when evaluating total insect damage in 2006, with the Covington variety incurring more total damage than the Beauregard and Evangeline varieties (F = 4.75, P = 0.0162) (Table 3). In addition, the insecticide*variety interaction was not significant in 2006 for CB or total insect damage (CB: F = 1.15, P = 0.3611; Total: F = 0.40, P = 0.9110). Insect damage was lower in 2007 than in 2006. Total soil insect damage ranged from 40% in non-treated plots to 13.25% in plots treated with bifenthrin (Table 2). CB accounted for the majority of the damage; approximately 40% in 2007 (Table 2). Similar to 2006, all insecticide treatments had significantly less damage than the non-treated control for total insect damage and for CB damage (Total: F = 4.46, P = 0.0157; CB: F = 4.68, P = 0.0138) (Table 2). No significant differences in insect damage were detected between the three varieties evaluated in 2007 for total insect damage or CB damage (Total: F = 0.68, P= 0.5158; CB: F = 0.23, P = 0.7984) (Table 3). In addition, the insecticide*variety interaction was not significant in 2007 for CB or total insect damage (CB: F = 0.20, P = 0.9895; Total: F = 1.21, P = 0.3266). All yield data for 2006 and 2007 are summarized in Table 3. Total yield varied between treatments by as much as 7.84 MT/ha (140 bushels per acre) in 2006 and by approximately 5.32 MT/ha (95 bushels per acre) in 2007 (Table 3). Similar trends were seen for U.S. No. 1 yield (Table 3). The Beauregard variety produced significantly higher yields than did the Evangeline and the Covington varieties in 2006 and 2007 (2006 Total: F = 5.65, P < 0.00417; 2006 U.S. No. 1: F = 7.77, P = 0.00216); (2007 Total: F = 10.60, P = 0.0010, U.S. No. 1: F = 14.39, P < 0.0051). No significant differences in U.S. No. 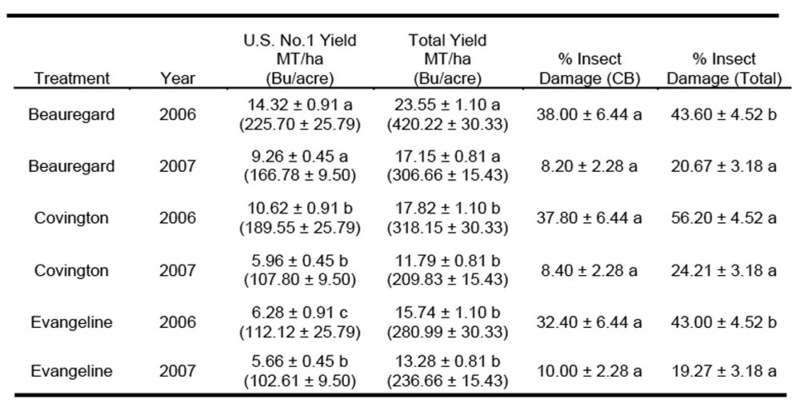 1 or total yield were detected between treatments in 2006 (Table 1). In 2007, only the Lorsban/Mocap treatment resulted in significantly reduced yield compared to the non-treated control (Table 2). Table 1. Least squared mean yield MT/ha (± SEM) (50 # bushels/acre) and percent insect damage (± SEM) associated with four insecticides regimes in sweetpotato, 2006. Treatment means are averaged across all varieties evaluated. Treatment means followed by the same letter are not significantly different by Tukey-Kramer HSD P > 0.05. (± SEM) associated with four insecticides regimes in sweetpotato, 2007. Treatment means are averaged across all varieties evaluated. Treatment means followed by the same letter are not significantly different, P > 0.05, Tukey-Kramer HSD. Sweetpotato is an aesthetic crop and minimal insect damage can render a storage root unsuitable for the fresh market. Producers receive a premium price for U.S. No. 1 grade roots which must be devoid of insect damage to meet grade standards. In addition to soil applied preplant insecticides, producers routinely apply foliar insecticides throughout the season and have recently started applying lay-by soil insecticides at 20–30 days after transplanting to supplement their soil insect management programs. (± SEM) associated with three commercial sweetpotato cultivars. Data within columns, within years, followed by the same letter are not significantly different by LSD, P > 0.05. Yield and insect data for each variety presented were averaged across all insecticide regimes. All preplant insecticides evaluated in the current study were effective in reducing soil insect damage in sweetpotato in 2006 and 2007 and bifenthrin resulted in the least amount of soil insect damage realized in 2006 and 2007. In 2006 total soil insect damage was reduced by 40-57% with the various preplant insecticides evaluated. In 2007 total soil insect damage was reduced by 10-20%. Insect damage was similar between all varieties evaluated in 2006 and 2007. Only the Covington variety incurred significantly more damage in 2006 compared to Evangeline and Beauregard varieties. Each of these varieties is commercially produced throughout the United States. In general, U.S. No. 1 and total yields were reduced in 2006 and 2007 compared to average yields realized in Louisiana during the same years. Average statewide (total yield) reported in 2006 and 2007 was 344 and 385 bushels/acre, respectively (LSU AgCenter 2007, 2008). Both U.S. No. 1 and total yields were higher in non-treated plots compared to all other insecticide regimes evaluated in 2006 and 2007. However, no statistical differences in yield were detected between treatments in 2006, and in 2007, only the Lorsban/Mocap treatment had significantly reduced yield compared to the non-treated control. Previous studies in sweetpotato suggested that no phytotoxicity is observed when ethoprop (Mocap®) is applied immediately prior to transplanting as it was in the current study (Hammond et al. 2006) while other studies have suggested that overall yield can be reduced in insecticide treated vs. non-treated plots (Burris 2006, Burris 2005). More recently, preliminary data has suggested that environmental and abiotic variables (pesticides) may negatively affect storage root initiation in sweetpotato during the first 20 days following transplanting (Villordon, personal communication). Ongoing studies are further evaluating the effects of insecticides on storage root initiation and harvestable yield in sweetpotato. In the current study, insecticide applications improved the quality of roots and ultimate marketability of the harvested crop. potato yield. Online. Annual Progress Report. LSU Agricultural Center, Northeast Research Station Annual Reports. potato yield and root injury. Online. Annual Progress Report. LSU Agricultural Center Northeast Research Station Annual Reports. Cuthbert, F. P. Jr. 1967. Insects affecting sweetpotatoes. USDA Agricultural Handbook. 329. 28 pp. control of banded cucumber beetles and white grubs in sweetpotatoes, 2007. Arthropod Management Tests Vol. 33.
banded cucumber beetles and white grubs in sweetpotatoes, 2006.Arthropod Management Tests Vol. 32.
in sweetpotato, 2005.Arthropod Management Tests Vol. 31. 2000.Arthropod Management Tests Vol. 26. LaBonte, D. R., P. W. Wilson, A. Q. Villordon, C. A. Clark. 2008. ‘Evangeline’ sweetpotato. HortScience. LSU AgCenter. 2008. Louisiana Summary of Agriculture and Natural Resources: 2007. Online. Louisiana State University Agricultural Center. sweetpotato, Ipomoea batatas (L.), in Mississippi. Midsouth Entomologist 2:10-16. Rolston, L. H., C. A. Clark, J. M. Cannon, W. M. Randle, E. G. Riley, P. W. Wilson, and M. L. Robbins. 1987. Beauregard sweetpotato. Hortscience 22: 1338-1339. SAS Institute Inc. 2007. SAS OnlineDoc® 9.1.2. Cary, NC: SAS Institute Inc. (eds.) Sweetpotato Pest Management: A Global Perspective. Westview Press Inc. Boulder, CO.
Sweetpotatoes. Louisiana State University Agricultural Center, Pub. No.2620. beetles and white grubs in sweetpotatoes, 2007.Arthropod Management Tests Vol. 33.
sweetpotato, 2000.Arthropod Management Tests Vol. 26. Yencho, G. C., K. V. Pecota, and J. R. Schultheis, Z. VanEsbroeck, G. J. Holmes, B. E. Little, A. C.
Thornton and Van-Den Truong. 2008. ‘Covington’ sweetpotato. Hortscience 43:1911-1914.